75 Main Street Dayton NV. It’s been a busy week. On Tuesday, the contractors poured the footings at the north and south ends of the hotel. 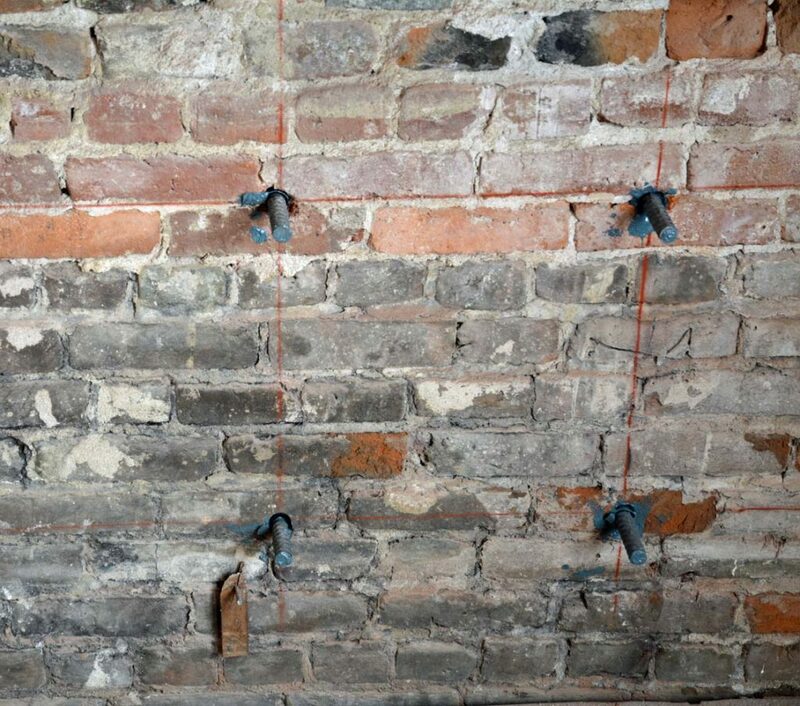 These will not only support the shotcrete on the walls above but also provide additional support to the wood floor. I would have liked to witness the pour but I was off picking up some doors that we found in Amador City. 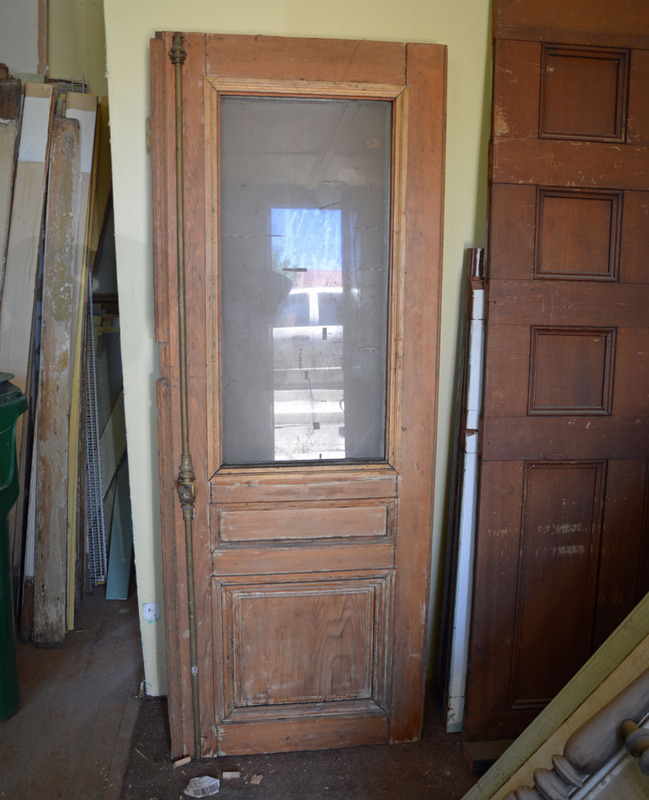 My wife and I had been exploring the gold country the previous weekend and ran across an estate sale that just happened to have three half lite exterior doors of the proper vintage. These look like they were leftovers from another restoration project because they were already stripped of paint. The joinery; however, was in pretty bad shape so I’ll have to glue and clamp the stiles to make them more solid. 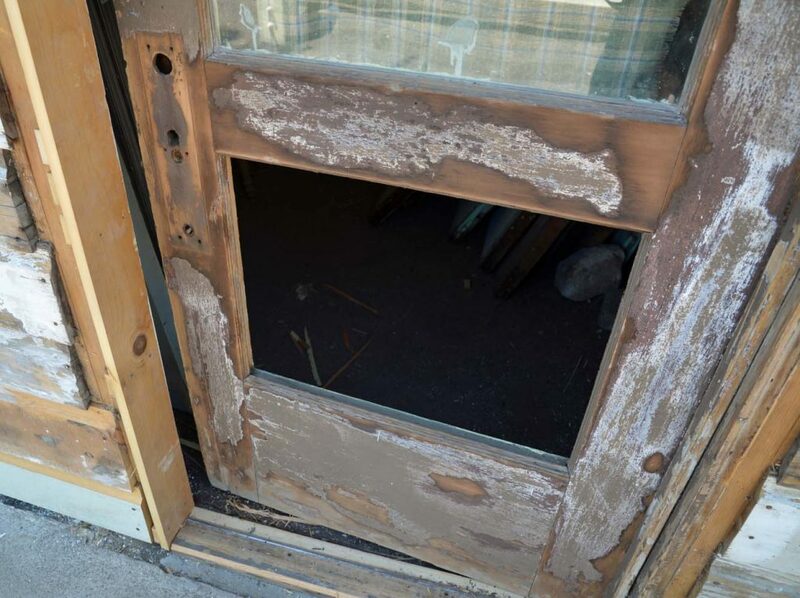 A little patching and priming will make them look good again and we’ll use them to replace the exterior doors at the front and back of the building where the originals had rotted away. Oh BTW, if you’re interested in becoming a neighbor, one of our friends is selling a house around the corner on River Street. Potential abounds in this turn-of-the-century home, constructed in Virginia City and relocated to historic old-town Dayton by horse and wagon. Established in 1900 and currently surrounded by period correct construction, this charming home is replete with opportunity, affording a chance to own a quintessential piece of Dayton and Virginia City history. This home resides in close walking proximity to restaurants, parks, and shops, including the old Union Hotel currently undergoing a substantial residential makeover. 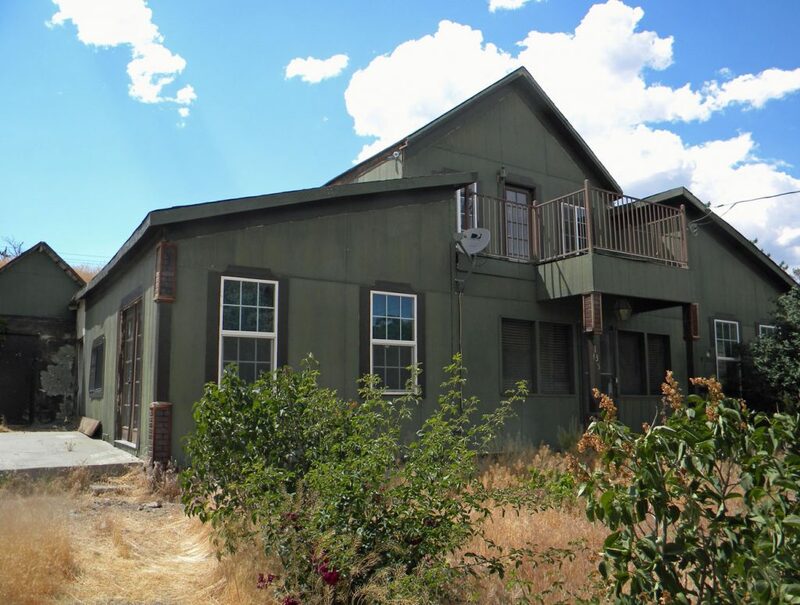 This listed River Street property is being sold as is; interested parties are strongly encouraged to seek professional guidance before presenting an offer to purchase this unique home and restoration project. Or, if you are more ambitious, the Odeon Hall is for sale as well. If you’re an old movie buff, this is one of the places where Marilyn Monroe, Clark Gable and Montgomery Clift were filmed in the movie “The Misfits”. There is one thing we have lots of and that is ugly exterior doors. Most of them are toast but a few can be saved with a bit of imagination. 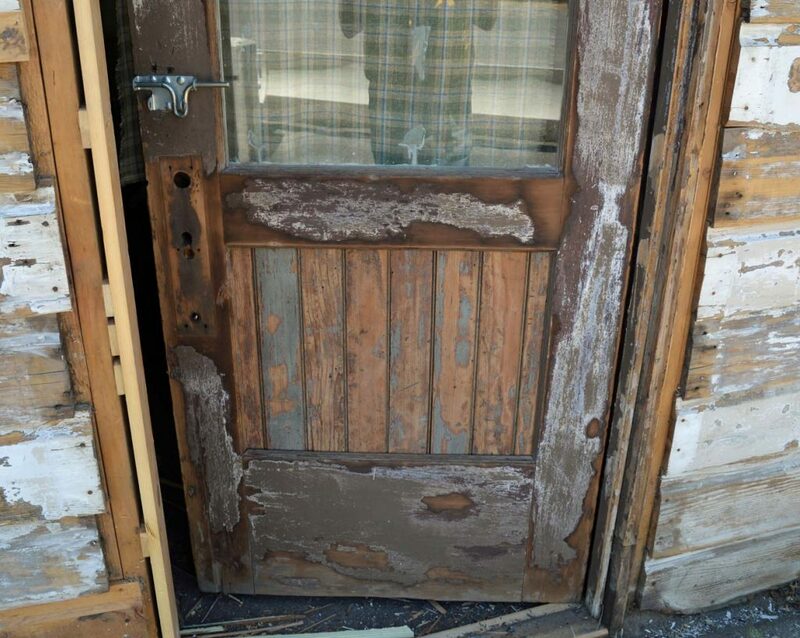 As a case in point, the front door to the old barber shop was as ugly as they come but remained structurally sound. The existing mortise lock was repairable, despite having been kicked in at some point, and the frame was still square… mostly. The one real problem it had was that the plywood on the lower panel had become unglued. 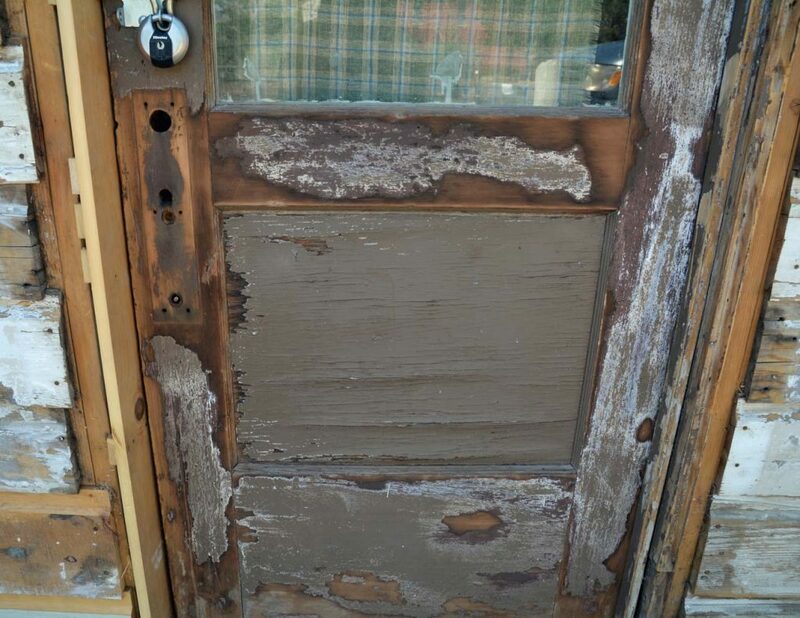 Even though this fit with our look of “Ghost Town Revival”, the old plywood was likely to trap water inside the door leading to further decay. So, looking around at salvaged materials, I hatched a cunning plan. The first step was to carefully remove the old plywood panel. There was wood molding holding the panel in place on the inside of the door which I removed with a chisel. This allowed the panel to come out while leaving the molding on the exterior of the door intact. 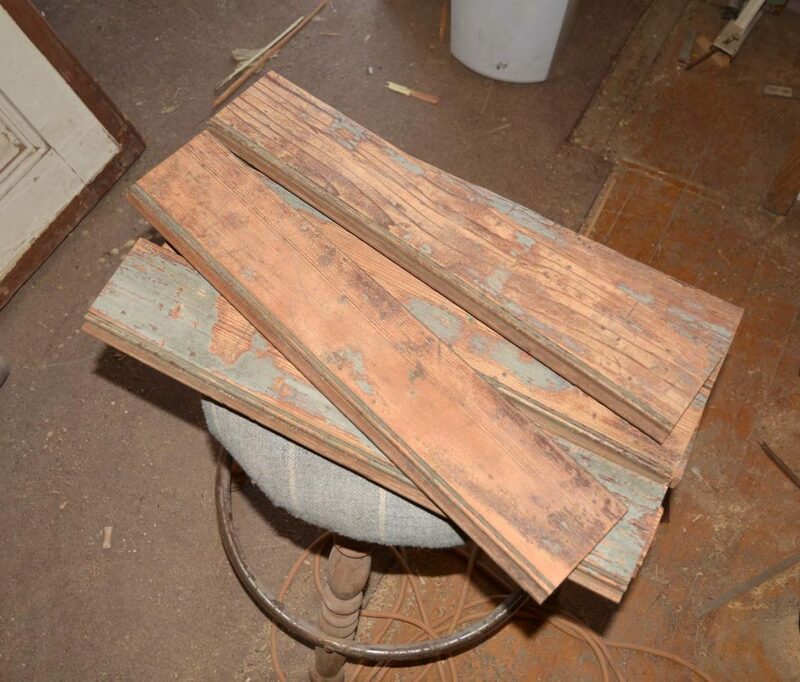 Once that was done, I salvaged some tongue and groove boards from the original saloon wainscotting. With a bit of cutting and scraping, the boards were reading for their new task. Once tacked in place, I applied new trim to the back of the door to hold the boards in place. 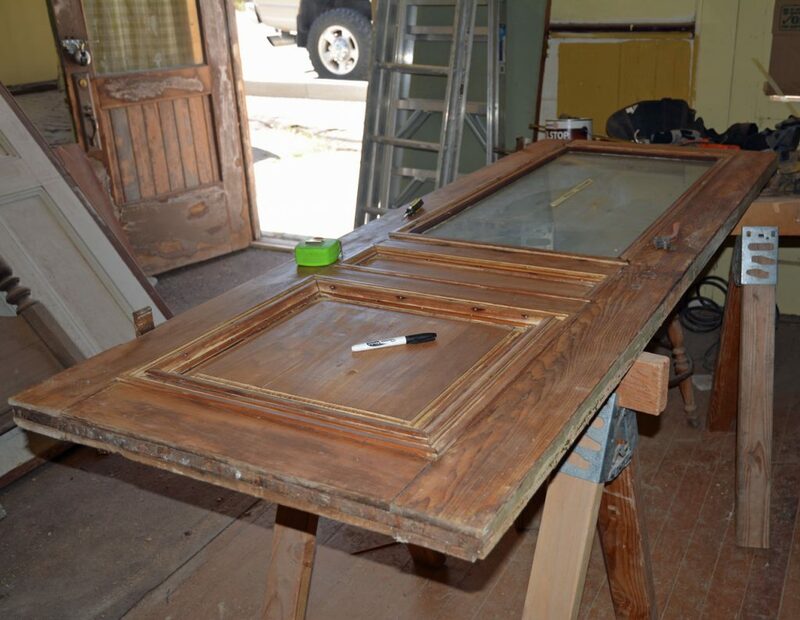 With priming and paint, the tongue and groove boards will really make the door look nicer. Now that the side foundations have been poured and the windows boxed out, it’s time to place the anchors for the shotcrete. All the holes that the contractors drilled previously are now being filled with epoxy and reinforcing bar dowels. 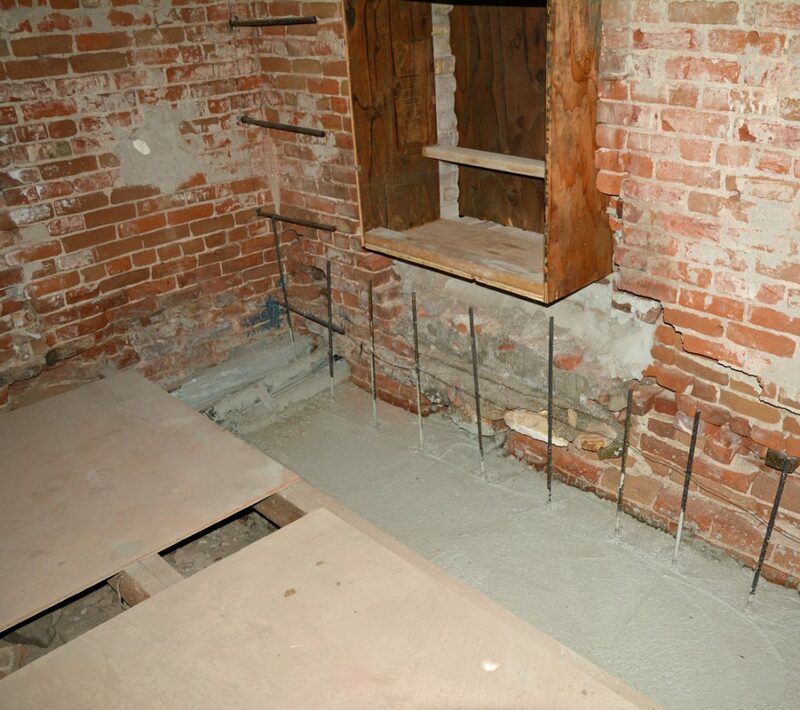 The shotcrete will be sprayed around these dowels thus providing a solid connection between the shotcrete and the existing brick wall. The act of gluing these dowels in place is the second easiest job in the operation. The easiest job is performed by the inspection engineer who watches to make sure that all of the dowels are glued in correctly. This is only a formality since I trust my contractors to do the job right the first time but the code book says I have to have the engineer present or the job does not get signed off. The hitch is that engineers are expensive, work by the hour and I won’t know how many hours until the project is done. The budget hates this. 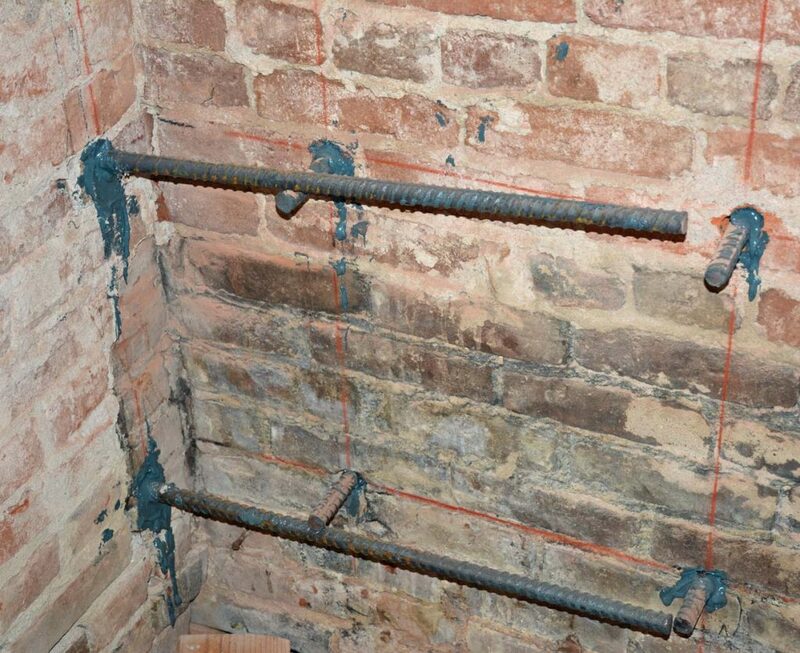 At the edges of the shotcrete walls, there are more anchors that will eventually become part of a web of reinforcing bar inside the shotcrete walls. PS: We cast no aspersions. The engineer is a really nice guy and we’re happy to have him on the job. Just wish I could have gotten my own engineering degree when I was in college. In my last post, I was proud to announce the pouring of the new footings. You can see the result in the picture below. 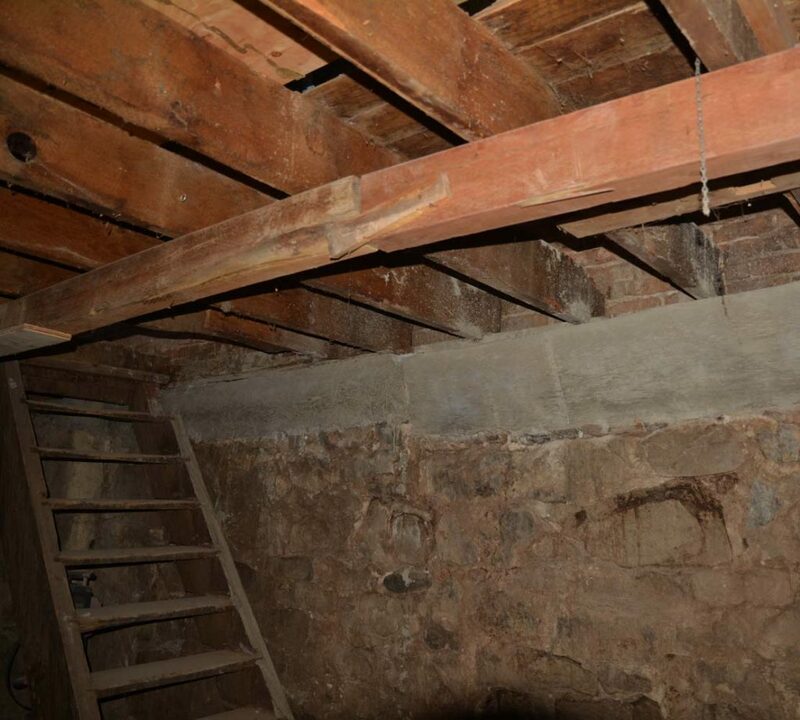 The floor joists are now firmly supported by a continuous concrete beam and the rotting wood blocks are gone. This is the basement view. Now that the footings are done, the next step is to apply the shotcrete to the front and back walls of the hotel. On the first floor, the shotcrete will be 8″ thick and all the windows and doors require forms around them to keep the rough openings square during the pour. The forms give you a good idea of how thick the shotcrete will be and our cats agree that the increased windowsill depth will give them plenty of space for sunbathing. The second floor will receive only 4″ of shotcrete providing less space for this feline pastime but they will just have to make the best of it. Meanwhile, up on the roof, we’ve completed a bit of exploratory surgery. 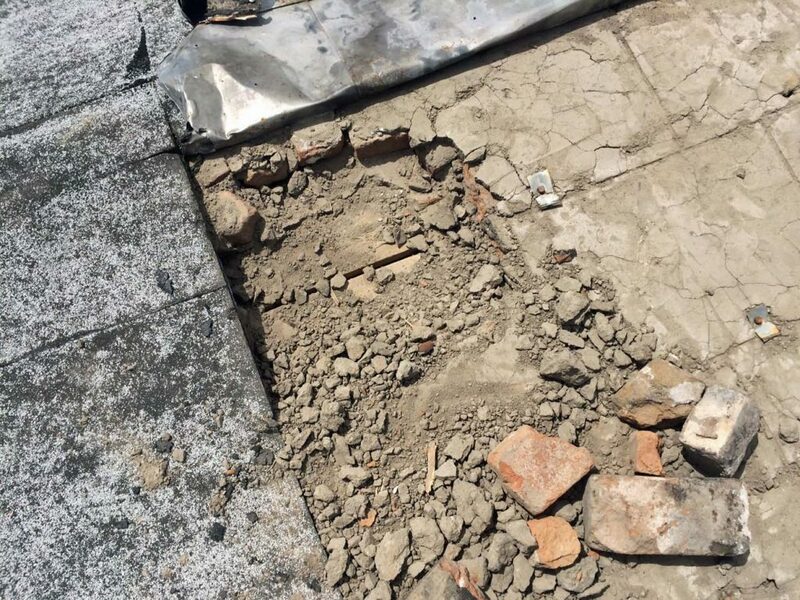 The challenge was that we could not get a bid on removing the old roof without knowing exactly what was under the tar paper. 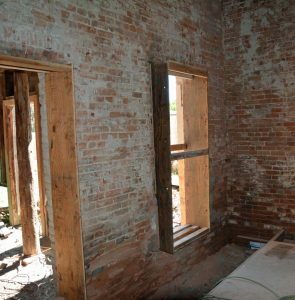 We did know that there was a layer of brick on top of the sheathing because we could see it from below through knot holes in the sheathing. This made everyone a bit nervous so we pulled a section of roofing apart to see how horrible it actually was. 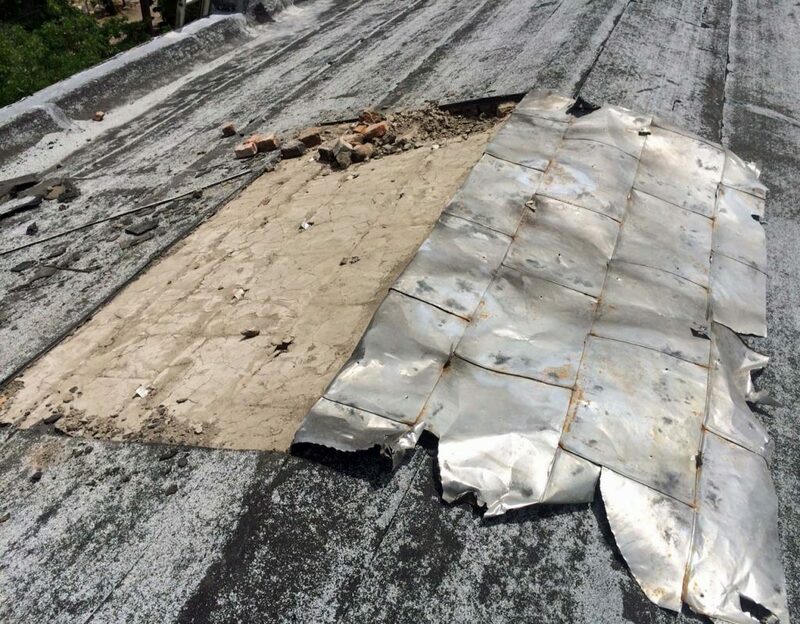 As it turned out, there were two layers of asphalt roofing on top of one layer of tin roofing. Under that was a layer of mortar on top of the same bricks that we could see from below. This could have been a disaster but instead, the mortar turned out to be so soft that one could crumble it in one’s hand. I suspect that this roof will be easier to remove than a typical asphalt shingle roof.